It's been a rough month for San Francisco cab drivers. Last week, most of the city's drivers lost their right to pick up passengers at San Francisco International Airport. Now, they're all losing their right to organize at the airport. SFO officials this week said they planned to ban drivers from participating in “free speech” activities at most places in the airport, citing concerns with increased congestion and public safety that could result from organizing activities. The rules would prohibit drivers from organizing activities in the garage and staging lot, the main areas taxi drivers have organized in the past. A representative of SFO said that drivers would be able to conduct free speech activities at a picnic table in the lot. "The Airport was not designed and is not intended for use as a public forum for free speech activities," SFO's announcement stated. 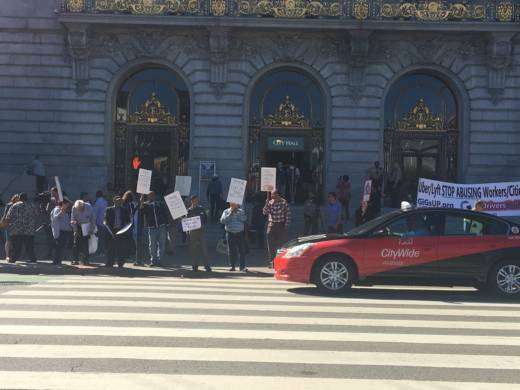 Cab drivers say that SFO is infringing on their First Amendment rights. SFO has long been a central location for taxicab organizing, particularly since the arrival and proliferation of Uber and Lyft in 2012. Mark Gruberg is a driver in the San Francisco Taxi Workers Alliance. "The airport is essential for organizing," he said, noting that it's particularly important right now after the Municipal Transportation Agency's vote last week to prohibit more than half of San Francisco's licensed cab drivers from picking up passengers up at the airport. "It’s the only common area that cab drivers have." Under the new regulations, only cab drivers who bought their $250,000 taxi medallions after 2010 -- as opposed to those who received them through the prior seniority system -- will be allowed to give rides to customers at the airport. The MTA said the move is an effort to help the drivers who have taken the biggest financial hit from the medallion meltdown. But that gain is coming at the loss of their fellow drivers. Under the new rules, only about 550 cabs would be eligible to pick up passengers at the airport. This means that, although all taxis could still drop off passengers at SFO, two-thirds of the entire fleet would be barred from pickup. It's still unclear how this new rule will be enforced. SFO said it was reviewing the rule and will respond to the MTA by mid-November, a spokesperson said. The airport is one of the last bastions for cab drivers in San Francisco to reliably make a buck and compete with the overwhelming number of Uber and Lyft cars on the road. In response to the MTA's decision, many drivers said that if they couldn't go to the airport, it wouldn't be financially feasible for them to go out at all. Gruberg is one of the cab drivers who received his medallion through the seniority system and who will now be barred from picking up passengers at the airport. Losing airport access may push them to stop driving altogether, Gruberg said. He also worried that not being able to distribute leaflets at the airport would be detrimental to organizing efforts. He called the MTA airport ban and the SFO anti-organizing rule a one-two punch against the taxi industry. "These two things are related," Gruberg said. "And they’re trying to stifle cab drivers organizing and having any way to effectively combat the MTA’s decision." Under SFO's new rule, Lyft and Uber drivers will not be able to organize at most places in the airport either. But unlike taxicabs, all those drivers can still continue to pick up passengers at the airport.